Your feet carry you around for a lifetime. There are numerous kinds of foot problems resulting from today’s changing lifestyles. 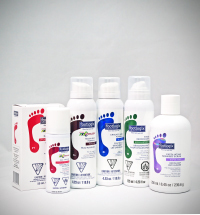 These problems can be easily addressed by using the right foot care products. Use this visual guide to learn more about the most common problems in the skin and nails of the feet and their corresponding Footlogix Solutions. Tired, heavy legs from walking or standing for long periods of time can become very uncomfortable. Lifting and yellow discolouration of toenails (often a fungal nail infection) can be very unsightly.